Class is FULL! Thanks everyone! 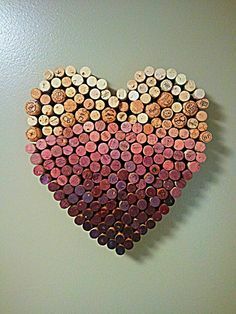 We have been saving all our red, pink and in between corks for 2 years waiting to find something too do with them! Come make a darling wreath with a wooden back that measures 11.5″ X 11″ with a hanger and decorate with ribbon and/or raffia. Plenty of corks saved for graduated colors as shown in this sample. Cost is $35 and will include one glass of wine and your evening heavy snacks like we always do. Decided to do a Friday night instead of Saturday this time so as to accommodate anyone celebrating Valentines Day on the weekend prior to Valentines Day.